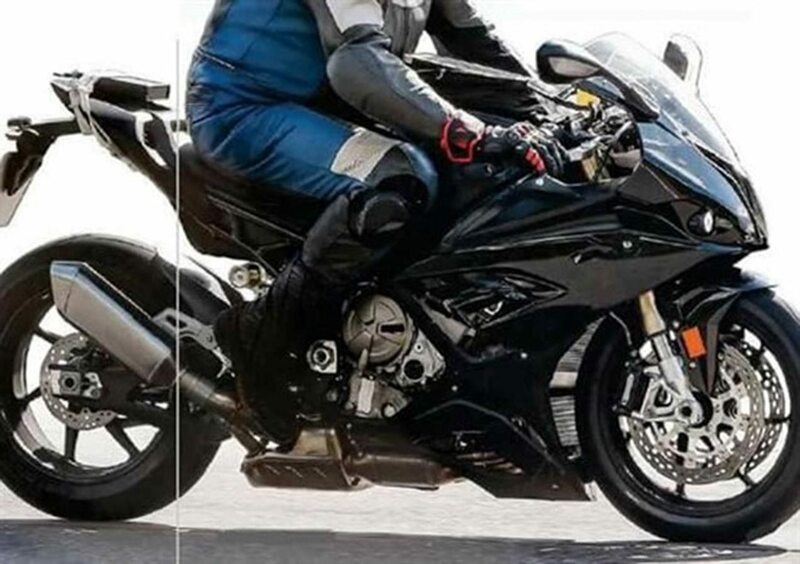 2018 BMW S1000RR was recently spotted testing in Europe. The motorcycle is currently the flagship supersport product in BMW lineup, competing successful worldwide with rivals like Yamaha R1, Kawasaki ZX-10R, Suzuki GSX-R1000 and Honda CBR1000RR. In fact, it was placed at a very high price point before the official entry of BMW Motorrad in India. The 2018 version comes with all new fascia, looking clean and much more serious than the present generation. One can spot an eye shaped headlight area with considerable changes to the lean looking front fascia. The exhaust can is now smaller and much in sync with the body design. The tail section seems smaller than before and may result in tougher pillion riding experience. Overall, the sides are exposed on the test mule, revealing a slight portion of its effective lightweight frame. The front half lost some of its muscle with a new pattern of design on the side fairing. BMW is expected to offer a more powerful tune to their four cylinder liter class engine, making the BMW S1000RR quicker and even more fun to drive in its 2018 variant. It will get new alloy wheels, better instrument console and color TFT on this new variant. 2018 BMW S1000RR is expected to receive a global welcome at EICMA 2017. The show will start on Nov 6, 2017 and will bring loads of other exciting products and future concepts. 2017 BMW S1000RR is powered by a 999cc, four cylinder engine producing 199 HP at 13,500 rpm and 113 Nm at 10,500 rpm. It comes mated to a 6-speed gearbox and weighs 208 kg. BMW could bring the 2018 S1000RR with a lower weight (probably under 200 kg) for exception power to weight ratio. Ducati is even preparing a V4 engine motorcycle that will strictly rival the upcoming BMW internationally.